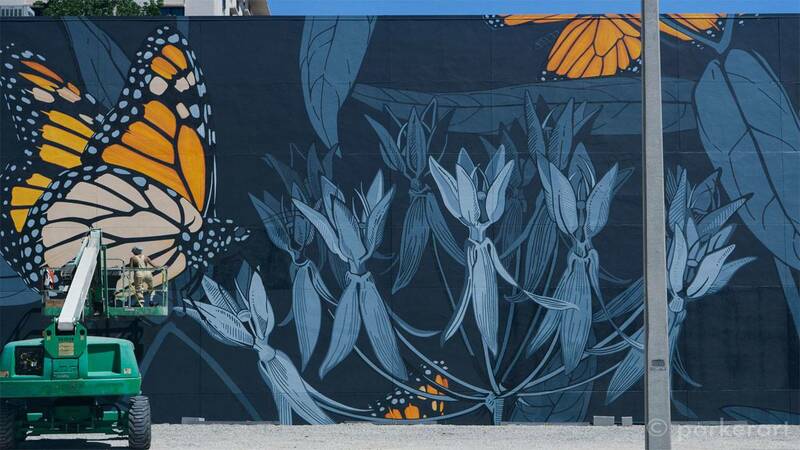 The newest additions to Orlando’s murals have a greater purpose that the artists and the Nature Conservancy hope will spark a conversation about Florida’s threatened ecosystems by focusing on a soon-to-be endangered species -- the monarch butterfly. Drivers turning onto University Boulevard at Semoran may be surprised, and hopefully, curious about the Full Sail University studio building next to Taco Bell, now covered in gigantic bright orange butterflies and violet milkweed flowers. In the last 20 years, U.S. monarch populations have dropped more than 85 percent, according to The Nature Conservancy. That drop was attributed to genetically engineered crops, like soybeans and corn, carrying higher pesticides and wiping out native milkweed normally found in fields that make up the monarch butterfly's main food source. Monarchs lay their eggs in milkweed and eat the plant, making their larvae toxic to predators and giving them their vibrant orange colors indicating to other animals they are poisonous. The federal government is currently considering giving the monarch butterfly an endangered species status. Before that happens, the environmental group is launching the Monarch Initiative during April, known as Earth Month, to raise awareness about the insects native to 49 states in the U.S. and Mexico. The Nature Conservancy, partnered with Full Sail University and Ink Dwell, an environmental art installation group, to create the Monarch Initiative to educate the public about the colorful butterflies, their annual migrations and their dwindling food sources, which are also impacting human food sources. The first mural at Full Sail called the "Milkweed Galaxy" was completed by Ink Dwell artists in February. The conservancy will host the official launch of the collaboration in front of the Full Sail mural on April 19. In March, Jane Kim, founder of Ink Dwell studio, and her team of artists completed a second Monarch butterfly mural in downtown Orlando on Magnolia Street next to the Dr. Phillips Center for the Performing Arts. The 36-year-old artist and scientific illustrator said she co-founded the San Francisco-based Ink Dwell Studios to educate people about the natural world through art. The Monarch Initiative was the first time Kim has taken on a project in Florida, but it is part of a series known as the Migrating Mural. Outside of the Orlando area, Migrating Murals also cover an eight-story air traffic control tower at the Springdale Airport in Arkansas, another is in Pacific Grove, California, where the butterflies typically spend their winters. “As soon as someone becomes familiar with a subject all the sudden they see it, more, and they tell us, and they say, ‘Wow, I didn’t ever notice monarchs before, but now I see them all the time,’" Kim said standing in front of the Full Sail mural. "I think that’s one of the most meaningful ways that this project can help people and The Nature Conservancy in general." Full Sail President Garry Jones said when The Nature Conservancy approached him about the project more than two years ago, he knew it was one the university could sink its teeth into and adopted the initiative into their community. Emerging media, digital and production students and graduates were involved in creating a campaign for the Monarch Initiative. Stephany Cerella Nazari, a recent graduate of media communication, is leading a team of 16 students working on the multimedia campaign. In February, an all female production team and their instructor were out at the mural on University Boulevard shooting video and interviewing Kim for their campaign. Jones said, standing nearby, that the universities alum and students are passionate about the natural world. “Our students, our faculty and our staff have championed this whole notion of environmental stewardship,” Jones said. Northern monarchs migrate to Florida, Mexico and Southern California beginning in September. In the spring, the butterflies migrate back up north to the Midwest and Pacific Coast. Along the more than 3,000-mile migration path the bright butterflies pollinate flowers and plants, including many food sources for creatures higher up on the food chain: humans. The great migration also spans several generations of butterflies. In central Mexico, tens of millions of butterflies overwinter in less than 20 sites, gathering in 20-30 million per roost. They begin leaving in late February and early March, mating and then flying north, usually making it to Texas before laying their eggs on milkweed plants. The next generation continues the migration, leapfrogging north until the third or fourth generation arrives as far north as Canada in May and June. This final generation migrates up to 2,200 miles back to Mexico, arriving in early November. 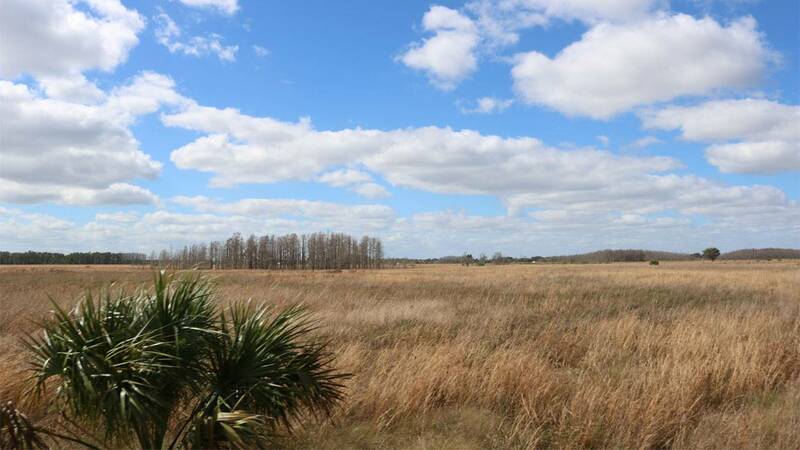 The Nature Conservancy manages the Disney Wildness Preserve in Osceola County. Florida is one of the only places in the U.S. where monarchs can live year round because of the climate. The Nature Conservancy Disney Wilderness Preserve is home to acres of native milkweed and a prime spot for monarchs. On Feb. 21, the only butterflies in sight were zebras, with black and white wings. The Conservancy’s Central Florida conservation director and Florida fire manager Zachary Prusak’s boots crunched among knee high growth, made possible by a controlled burn last July. Fire, Prusak said, is the main ingredient to maintaining a healthy ecosystem for not only butterflies, but all other invertebrates. When Florida-native milkweed is in bloom monarch butterflies descend and feed on the flowers before migrating on. A Migrating Mural in progress in Janurary 2018 on University Blvd. in Winter Park on the Full Sail campus. 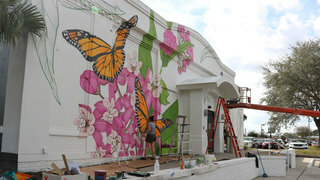 An Ink Dwell Studios artist paints a Migrating Mural on the Full Sail University studio building. The Conservancy’s Central Florida conservation director and Florida fire manager Zachary Prusak at the Disney Wildnerness Preserve managed by The Nature Conservancy on February 21, 2018. An Ink Dwell artist paints a Migrating Mural on University Blvd. at Full Sail University. The Disney Kissimmee Preserve is home to native milkweed, the main food source for monarch butterflies. The Monarch Butterfly population has declined by 85 percent in the last 20 years. Photo: The Nature Conservancy. The charismatic butterfly serves a "canary in the coal mine" for other environmental impacts, explained Prusak. 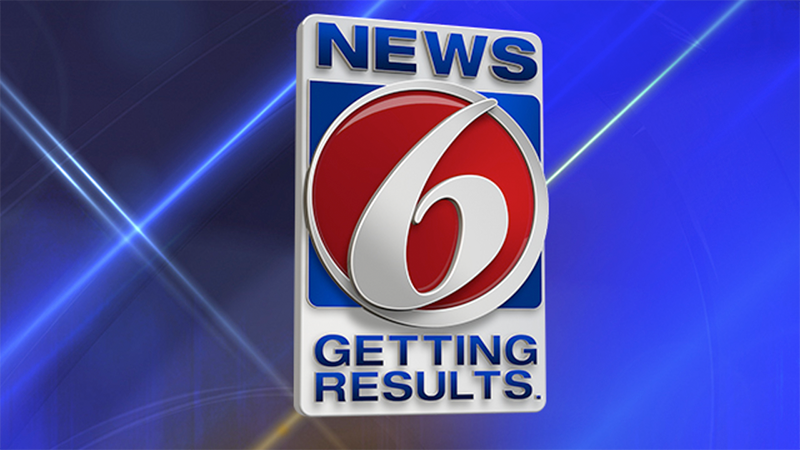 "If it's declining, there must be something else going on with other populations that we need to pay attention to," he said. 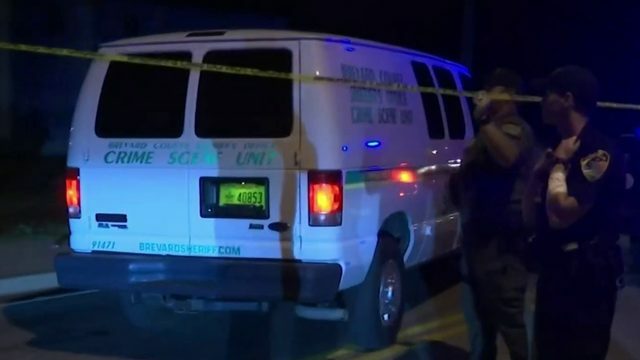 Citizens can actually help restore the lost habitat by planting Florida native milkweed in their own yards and by be coming involved in other ways, according to The Nature Conservancy. The are more than 100 documented types of milkweed, according to Monarch Watch, a conservancy group dedicated to restoring and tracking the butterfly population native to North America. The Nature Conservancy executive director Temperience Morgan said the Monarch is a symbol of many environmental issues she hopes people will speak up about. "It’s no longer possible, unfortunately, to be an armchair environmentalist," Morgan said. "We really need the people who care about nature, and understand the benefits of it, to join us on the front line."